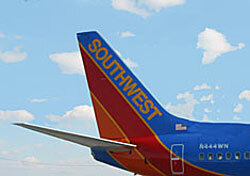 In the first merger of major low-cost carriers, Southwest has agreed to buy AirTran for $1.4 billion. The deal will expand Southwest’s service from many major cities currently served by AirTran, and open the door to Southwest’s first international service, as AirTran currently flies to destinations in the Caribbean and Mexico. Once completed, the merged carrier will serve roughly 100 million people a year from 100 airports with 685 aircraft. It will fly under the Southwest name and colors. AirTran’s entire fleet is currently equipped with in-flight wireless access. AirTran also offers business class seating, unlike Southwest. For now, little will change from a customer perspective. The two airlines will operate separately until the merger is closed, following the standard regulatory process. Readers, do you think this is a good deal for Southwest? What about AirTran? Are you excited about the prospect of expanded Southwest service?